One of the breakthrough otaku-targeted events last year was the Taku Taku Matsuri’s natsu matsuri, or summer festival, where about 300 people showed up at Hawaii Kotohira Jinsha-Hawaii Dazaifu Tenmangu on a sunny Sunday in August to cosplay, play games, buy Japanese-themed merchandise and food from a number of vendors, enjoy entertainment and just have a fun time overall. As I wrote last year, organizer Yuka C. Nagaoka started Taku Taku Matsuri to give local fans of anime and manga culture another venue where they could gather, similar to the events she took part in growing up in Japan. This year, Taku Taku Matsuri was scheduled for Saturday, Aug. 9. It promised to be bigger — a one-day mini-anime con of sorts being held at the Japanese Cultural Center of Hawaii’s Manoa Grand Ballroom, with a Star Trek-themed cafe, video game tournaments, a dance party featuring DJ E2D, and special guest Kyle Hebert. But the tournaments were quietly dropped, DJ E2D pulled out … and then the dual threat of Hurricanes Iselle and Julio took care of the rest. The show, however, will go on. Yuka said as much, announcing a new date — Saturday, Nov. 22 — along with a new rallying cry, “We will make it happen.” But there’s still the venue, activities and higher costs to deal with. As she told me before, without any sponsors, she has to pay for everything out of pocket … and those costs add up pretty quickly. And that’s where the second Second Annual Taku Taku Matsuri crowdfunding campaign comes in. If this all sounds familiar to you, you’re right; we’re looking at another $2,000 funding goal to reach and more $10 pre-sale tickets and $20 ticket/T-shirt bundles available, albeit this time on the GoFundMe platform instead of Kickstarter. The change removes the nail-biting element from the first campaign — Yuka told me she switched because she gets to keep whatever she raises regardless of whether the goal is met by Oct. 25, unlike Kickstarter’s all-or-nothing approach. Those of you who bought in during the Kickstarter campaign, don’t worry: You don’t have to give any more during this round. Yuka will honor all tickets sold during that campaign. For those of you who chose the $100 perk, she’s also trying to book a replacement guest that will be able to make a special meal appearance as well. Which brings us to the other unknown about Summer Taku Taku Matsuri in Fall: who, if anyone, will fill the “guest of honor” slot. It’s already been confirmed that Kyle Hebert will not be returning for the make-up event (stick around for a bit of Otaku Ohana-related news about that at the end of this post, though). Yuka’s trying to find a replacement guest, but with three months between now and the event itself and many other conventions and events being booked with guests far in advance, she’s not sure she can pull it off. Several artists and craft vendors have had to pull out of the rescheduled event as well, most likely because the new date is in the heart of the lucrative holiday craft fair season. So if you’re an artist or vendor looking for some exposure, spaces are now available. Arashi in concert: Judging by my Facebook friends’ timeline, the arrival of five-member boy band Arashi for concerts at 5:30 p.m. Sept. 19 and 20 at Ko Olina’s Naia Lagoon 3 is a Pretty Big Deal. Is it worth paying $150 per ticket ($75 for children under 15)? Or would we be better off heading over to Shirokiya and its pop-up Arashi Shop to get CDs “and other items not normally available in Hawaii” and calling it a day? We’ll find out starting Saturday, when tickets go on sale at 9 a.m. exclusively at Ticketmaster.com. Be sure to check out Tom Moffatt Productions’ Facebook event page to see all the rules and procedures involved; the key elements to note are that there’s a four-ticket limit, sales are limited to customers in the United States and Canada, and you’re going to have to bring the credit card you used to order the tickets to the show itself. Aiea Library Anime Club: It’s back! The new conference room is really nice! And as I’ll probably point out until the library moves to a new location, there’s plenty of parking! This month, young adult librarian Diane Masaki is screening Appleseed: Alpha, the latest computer-animated film in the franchise directed by two-time Kawaii Kon guest Shinji Aramaki. At the library, 99-374 Pohai Place. For more information or to RSVP, call 483-7333 or e-mail aiealibraryanimeclub@yahoo.com. 3 p.m. Saturday. 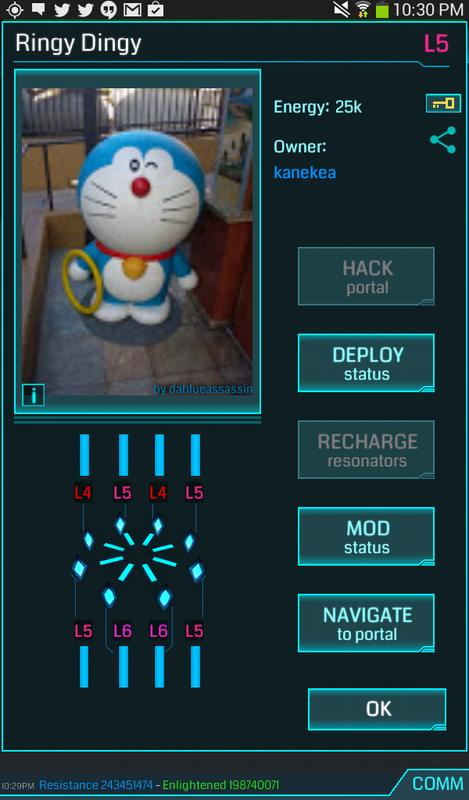 Random Ingress portal of the post: With Ingress arriving on iOS, it’s now available to almost everyone with a smartphone (sorry, Windows Phone and Blackberry users). I think it’s about time to introduce this new recurring feature to the Ota-cool calendar. Let’s start with this portal. Yes, ol’ Ringy Dingy is actually Pass Loop Doraemon from my statue cat-alog earlier this year, located on the third floor of Ala Moana, in the Nordstrom wing. Please note that while Doraemon is blue, his portal should be green. Just sayin’. Anime Day at Windward Mall: Kawaii Kon is back for its third year of mini-con craziness across the Koolaus. I’d imagine more details will be released in coming weeks, but I’d expect art events, cosplay contests, free anime screenings and a mini Artist Alley to be part of the day. Also, it’s coinciding again with Star Wars Reads Day, which makes Diane sad because she can’t go again this year. 10 a.m.-4 p.m. Saturday, Oct. 11. As I mentioned earlier, Kyle Hebert won’t be coming back for Summer Taku Taku Matsuri in Fall. He did, however, make it down to Hawaii. Two people got to sit down with him for formal interviews while he was here. One of them was Kell Komatsubara, as part of his ongoing “Ramblings About Something Close to Nothing” video blog series. That was sweetly nice one long sentence of the first paragraph. “… this time on the GoFundMe platform instead of Kickstarter. The change removes the nail-biting element from the first campaign — Yuka told me she switched because she gets to keep whatever she raises regardless of whether the goal is met …” — Jason S Y. The part “gets to keep whatever she raises regardless of whether the goal is met” does not exactly invoke confidence to fund … unless that mean one gets to keep the funds as long as it goes to the event(?). Or, does one gets to keep the funds regardless of failure to deliver the thing promised?